Lipomas are soft, movable, rubbery consistency, without pain fat cell masses under the skin, with size varying from .3-1.5 inches.Size of lipoma can remain same or increase gradually. Lipoma are non-cancerous growth. As per Dr.Abhishek genetic history plays an important role in lipoma. Incidence:Lipoma can develop at any age but it is more common in 30-40 yrs of age, female are more prone to develop lipoma as compare to males. A research study conducted at Aura Homeopathy Clinic & research centre reveals that females generally suffer from single big lipoma, where as in males multiple lipoma or adiposa dolorosa are more common. The exact cause is not known, but genetic history plays an important role. Lipoma may be due to increase fatty content in the body,it is advised to do regular exercise and follow proper diet restriction for reducing body weight. Lipomas are soft, movable, rubbery consistency, without pain masses under the skin, with size varying from .3-1.5 inches. Size of lipoma can remain same or increase gradually. 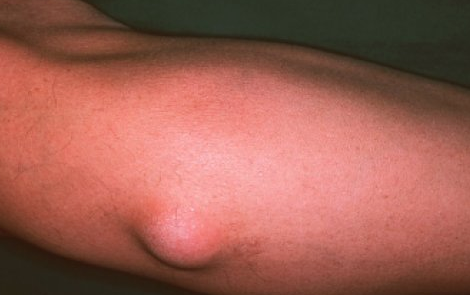 A lipoma can diagnosed by a qualified homeopathic doctor with its appearance only. In case of doubt biopsy can be done for cytological examination. Allopathy leave lipoma untreated if small in size and remove it surgically or liposuction if larger in size, and giving pressure symptoms like pain and discomfort. But the condition re-surface even after surgical removal. On the other hand as per Dr.Abhishek if Homeopathic medicine is taken at initial condition the lipoma starts decreasing in size and number. It soften the lipoma growth. It is effective in decreasing the size gradually. Treatment reduce localised symptoms e.g. discomfort and pain. It helps in regulation of fat metabolism which is main cause of lipoma. There are 36 homeopathic medicines which can give great relief for lipoma. Complete case study should be done by a qualified Homeopathic Doctor for choosing correct remedy.